MainBlogsFundamentally FreundNext Year in Gush Katif! 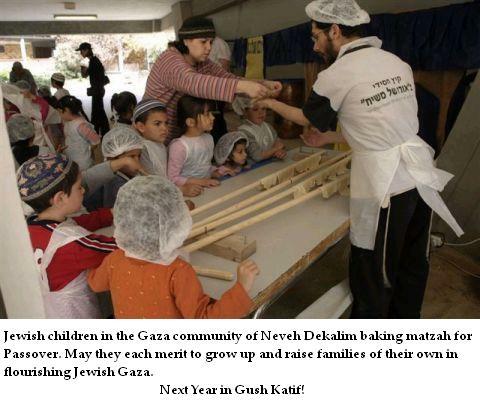 Next Year in Gush Katif! As Jews around the world gather together to celebrate the start of Passover this weekend, our thoughts and prayers inevitably turn towards our brethren living in Gush Katif and northern Samaria. Despite enduring what must be indescribable pressure and anxiety, the 8,500 Jews living in the areas slated for expulsion continue with their daily lives, cleaning their homes and getting ready for the beginning of the festival. Like Jews everywhere, they will recite the Haggadah on Saturday night, recounting the Exodus of our ancestors from Egypt so very long ago, and hoping for a better future for our people wherever they might be. In these difficult times, with so much uncertainty in the air, it pays to remember the central lesson of the Passover story - namely, that G-d is actively involved in history, and He does intervene on behalf of His People. And we hope that He will see fit to do so once again. So when you reach the end of the Haggadah, and you raise your voice to declare "Next Year in Jerusalem", consider adding an additional thought - that not only should we merit to see the Holy City of Jerusalem rebuilt in all its glory, but that those celebrating Passover in Gush Katif this week should also be able to welcome the festival there again next year, too. And for many more years to come. Chag Pesach Kasher V'Sameach - a happy and kosher Passover for all.